On August 25, 2012, at age 65, Lt. Gen. Russel Honoré presented the inaugural class of the Honoré Center for Undergraduate Student Achievement. At a banquet for the center, based at Southern University at New Orleans, Honoré introduced 16 young men–all high school graduates but unable to meet the mandated admission requirements of a four-year college due to circumstances beyond their control. Nationally recognized as a champion for the disadvantaged, Honoré used his influence and vast network of contacts to build a solution for this inaugural class and future classes. He created an opportunity for underprivileged young men to realize a better life. 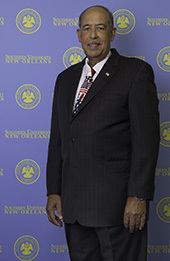 Renowned internationally for his masterful command and decisive actions to restore calm and order in post-Katrina New Orleans, Honoré honed his leadership skills over a lifetime of military service. Individuality and freedom of expression are essential American characteristics, but military service demands subservience to the chain of command. Orders are given and must be obeyed. In the military, you are free to think, evaluate and even disagree, but you are barred from acting on your own beliefs. While this situation might seem oppressive, it provides an ideal opportunity for those willing to listen, observe and learn. Honoré took full advantage of this opportunity to observe people: their needs, goals, challenges and how they interact with others. Through his silent study of human behavior, Honoré came to recognize the crushing burden that poverty placed on so many people’s lives. Today, as a highly respected and sought-after motivational speaker and guide, Honoré is leveraging his worldwide audience to give others a chance at success. Life experience has revealed to Lt. Gen. Russel Honoré the formidable enemy of poverty and the wisdom to lead us toward victory. Lt. Gen. Russel Honoré … Peoples Health Champion.